In all the excitement, our visas were about to expire. We booked tickets to go back to South Africa in December to renew them. I was nervous. I had so immersed myself in India; I hadn’t given much thought to our visas or South Africa. When it hit me, there were a few things we had to do. Wilf had always dreamed about having an old gramophone. We wanted to get him one for his birthday. Tony thought we should take an extra one to sell to help cover our air tickets. We planned to get them in Delhi on the way out. The other thing was to work on the girl’s eating habits. A few weeks before we left, I watched them eating with their Indian and Nepali friends. My thought was, “Oh my goodness, what will Val say?” They ate with their hands, shared food from plates and learnt from their Nepali friends how to lick their plates clean. I knew Val would be horrified. I got out the knives and forks. They needed a good cleaning. The girls were upset. They liked eating with their hands. The food tasted better and it was more fun. Poor things looked really awkward. We didn’t push it too much, but made it clear that only Indian food could be eaten with hands; not spaghetti or any Chinese food. They agreed. Tony went to an NCMI conference in August and took our Tibetan friend, Sonam with him. They had a great time but we really missed Tony. While he was away, I was forced to drive. I had avoided it up till then. Ash had to go to school and there were things to do, people to see. The roads were really steep and narrow. In some places there was only room for one vehicle. There was a lot of stopping and reversing and there were plenty of precarious edges and trenches to negotiate. It wasn’t long before I got the hang of it and actually started to enjoy that kind of driving. While Tony was away, Zoë got really confused and upset about something. We were talking about marriage and I told her that one day she would get married and have her own husband and she wouldn’t live with us anymore. BIG mistake. She got into such frenzy and started crying about me getting old. “But who will hold my hand? I want my own daddy back, not an old daddy. The one who left us. I want him!” Oh my goodness. She was so confused. It took ages to calm her down. When it was all over, we started talking about Jason and Ali and she asked me, “Mummy is marry Ali-ed? She realised her mistake and we laughed and laughed. Tony arrived back with the first five-year Indian visa ever granted from South Africa. It was amazing. The girls were on his visa and I would be given one at the end of the year. Coloured felt pens, tampons, tea towels, Marmite, ANY chocolates/sweets, vegetable peeler, choc chips, door runners, brewers yeast, good pens, contact lenses, kid’s videos and snacks. It was like Christmas and daddy was back! The old one. The one that left us. That one. Paul and Kirsten looked like hippies straight out of the sixties. Paul had longish dark hair, a bit of a mallet and a big moustache. 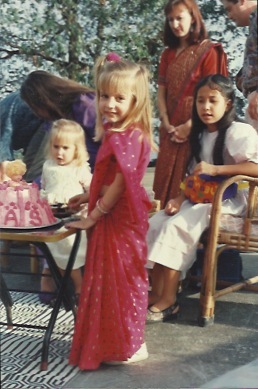 Kirsten always wore layers on layers or Indian clothes. She had long blonde hair. They had two children, Hannah and Jacob. They started coming to our meetings and we became good friends. Friends we could completely relax with. Tony and Paul would go for long runs along “Piggy Road” and all along the by-pass. Tony loved his chats with Paul. He really calmed him down. We always enjoyed visiting them in their arty little apartment in the senior boy’s dormitory at Woodstock school. They were dorm parents. They were also polar opposites. Kirsten was choleric and Paul was phlegmatic. Somehow they seemed to work well together. The senior boys gave them a hard time. Paul often found threats and graffiti in his office after busting them for doing something illegal. It really wasn’t what he enjoyed doing. He was a peacemaker and wanted love not war. He was calm and collected which irritated the boys even more. They really wanted to see him lose it. Paul had been in India since his early twenties. He was on the drug/hippy trail as Tony had been. He met Kirsten in Goa. She was on the same trail. They fell in love and started travelling together. Paul would get her to carry his illegal substances in her suitcase, which she did willingly. They got “married” and travelled to Laos where they lived for many years in a bamboo tree house. They learnt the language and lived simply, like their neighbours. Both of them were attracted to Buddhism and decided that was the answer to their spiritual emptiness. Paul checked himself into a monastery and Kirsten joined a woman’s one in another town. They shaved their hair, put on Buddhist robes and lived lives of celibacy. It was years before they were let out into the “real” world again. Paul was sure he had conquered his sinful nature and headed for the beach with his begging bowl. As he sat and watched the bikini clad ladies, he realised he wasn’t free at all. After ten years of chanting, meditating and cleansing himself, he was still having lustful thoughts. He was desperate and angry. As he went on, he realised that he actually had a Father in heaven; a Father who loved him. If he had a Father, it meant he was his son. Suddenly he fell onto the rock under the power of that great heavenly love. He woke up what seemed to be hours later. Everything was different. He got back to the monastery and opened a letter that had just arrived from Kirsten. In it, she was subtly trying to tell him that she had met with Jesus that week. She was planning to leave the monastery. What did he think? They made plans to meet each other and headed for India. Somehow they bumped into believers who helped them with their questions and new faith. Mussoorie was their last stop. They rented a one-roomed place with hardly any water or electricity. They had no money but Kirsten started making and selling candles to the foreigners on the hillside. She made just enough to cover their expenses. When we met them, they had come a long way. Paul sometimes led our prayer meetings and that was always interesting. He knew how to meditate and he was NEVER in a hurry to move on to the next thing. He was happy to wait for however long he needed to. Tony didn’t have the same patience. He would sit there thinking, “Ok, now what? What are we going to do now? Let’s move on.” He would open his eyes to look at Paul and there he was, quietly sitting in the same position with peace all over his face. For four years, we had talked about whether we should have another baby or not. I definitely was not keen for more pain but Tony gave me that, “Don’t even think about it,” look when the “v” word came up. I could tell that the only way he would consider it, was if he was offered something he really wanted; like a colour TV or something. We knew they were offering free transistor radios in South Africa, but that deal wasn’t available in India. It was very unlikely he was going to do it for nothing. Two children seemed to be the “in thing”. Two were easier to handle, it was cheaper, it was comfortable and it seemed like the perfect number of children to have. All of that was true, but we started to feel that someone was missing from our family. It felt incomplete. Tony had written in his diary in 1991 “Should we have Jordan?” I wrote, “Wondering about having another baby,” around the same time. We knew that if we didn’t, we would regret it all our lives. Somehow in all of our busy-ness, we kind of forgot to have a baby. In 1993 we started to talk about it seriously again. I was struggling to admit that I didn’t just want a baby, I really wanted a boy. Tony and I talked a lot about it. I knew it was out of our hands, but I wanted to make sure God heard and knew how strongly I felt, before we “went for it.” There were months when we felt ready to try and then I would chicken out. It was a confusing, emotional time for me. Asha was ready to go to school and we got a really good grant at Woodstock School. It was still way beyond our budget but we felt we should do it. She was so happy from day one. She made some good friends and it wasn’t long before Serena Mark, Ritika Roy and other little friends were sleeping over at our house. Zoë really missed her. She would sit and stare into space. When I asked her if she was ok, she replied, “ I am just sitting here thinking and thinking about Asha.” She kept herself busy playing with baby Angie and helping me at home. We hand painted little nations flags for church and she loved that. It wasn’t difficult keeping her occupied. Ash had her first cross country race at school. She did NOT want to do it. She woke up early that morning, crying and telling us she couldn’t do it. We tried to tell her she could and that she would enjoy it. It rained that day but the race was still on. Everyone was out on the road and Ash was in her brown shorts and bright yellow t-shirt. She had such cute, skinny little legs. We tried to encourage her without showing any sympathy. When she disappeared around the corner, I had to wipe my eyes. She looked so panicky. The walk was to Cosy Corner, which was literally around a few corners, but for Grade Ones it was like a marathon. All the kids got back, running through the rain with big smiles on their faces, but there was no sign of Ash. We waited for what seemed like ages. We had no idea what had happened to her. Finally, she came walking around the corner, through the rain with Mr Mark holding her hand. She had refused to run so he walked with her. She had walked all the way there and all the way back. She had also cried all the way there and all the way back. Every year we prayed about what was best for our children that year. We didn’t want to take it for granted, that just because we got a good grant in one of India’s most prestigious schools, our kids should go there indefinitely. We could see immediately that Ash’s attitude had changed. We found we were spending more time undoing things that we weren’t happy with. She would come home talking about boys kissing girls and who was whose boyfriend. We weren’t happy about that. She was in Grade One! One day, when Ash was eight and Zoë was seven, we sat them on the bed and told them the facts of life. We wanted to tell them before anyone else did. We had an amazing colouring book, which gave all the details about how babies were made. The girls were so interested and had no expectation about what was coming. When we told them how the daddy seed and the mummy seed met each other, they both responded the same way. The look on their faces was priceless. They looked at us as if to say, “You mean…?” When we nodded and repeated the process, they both laughed so much they fell off the bed and so did we. Well, almost. Left hand turn: Extend you arm and rotate it in antiblockwise direction. Which are the places the car should not be parked? Footh Path, pedestrain crossing, fire berigate. Carry only one pillion rider : Not even one children to sit on stand in front of you. Do not drive: Even tonics having alcohol contents. How to slop quickly: The best way is to slop quickly is to drive slowly. Driving at night: At higher speeds, the stoping distance exceed the seeing distance there by causing accidents. Flashing Amber light: Slow doen out proceed with caution. In case of accident? Given him medical attention and report the accident within 24 hour’s at the near of Police Station. T-Intersection: At T-Intersection the vehicle travelling on the road that ends must give way of to any vehicle travelling on the road, that continues. I went for my Indian license in Goa. I got into our jeep with Tony and the instructor. I drove down a dusty road and got into third gear. The guy told me to stop. He got out and wrote down my number plate number. Tony asked if there was a problem and he said, “Pick up your license in two days.” That was it. A friend of ours was really nervous about his learners test. He learnt the booklet from cover to cover and asked us to pray for him. When he was called in, the guy held up a red cross and asked him what it was. His answer was, “Hospital.” The guy told him to pick up his license the next day. We loved getting in the car and going on long road trips. There was not a moment of boredom. When we exhausted all known car games, we made up another one. “Let’s look for children along the way and see what they’re doing.” The girls loved that one. It was fun and serious. They were amazed to see how little girls their age carried such heavy things and how such little boys could handle such huge animals. One of our favourite things to do was to look for funny signs. I would jot them down and it wasn’t long before we had quite a list. We had fun reading them with our put on Indian accents. We were meeting all kinds of people from all over the world. During one of our mid-week meetings we met an American couple who were living in Kazakhstan. It was so interesting to hear about their lives and what was happening there. Actually nothing much was happening and they were feeling really discouraged. During the conversation they told us they had been living in a particular city for thirteen years. They had seen no fruit. We couldn’t even imagine how difficult that must have been for them. They were studying the language but had very few local friends or contacts. It was all so sad. On the other hand, they casually talked about a small village nearby that seemed to be experiencing some kind of a revival. There were reports of lots of people becoming spiritually aware and interested. They commented that there was a real need for teachers and mentors. My question seemed to surprise them. “Why don’t you go there?” They hadn’t considered it. Here was this young couple, discouraged and tired and in a city where there was no hunger for God. Just down the road, a revival was taking place and there was a huge need for people to help. What an opportunity. When we first got to Mussoorie we were green beans. We stayed that way for a long time. When we asked God how we should go about things, His answer was, “Watch what I’m doing and join me.” So we did. If He was working in that person’s life, we joined Him; then that person, then that one. It made the whole thing so much easier. Over the years we met people who felt called to “the nations”. They seemed convinced. Many of those countries were hard to get visas for; getting jobs was near to impossible. They spent months and years trying to get in. Many gave up and went back to their hometowns, feeling like failures. I started to think a lot about it. A big question I had was this: Are we to love the country or are we to love the people? Are we so “in love” with the country, or the idea of being in a country that we have neglected to love the people of that country? Tibet borders India. Tibet is a very difficult and expensive place to get visas for. Living and getting employment there requires great perseverance and a very clear and convincing call. If I am in love with the idea of living in Tibet, I will pour all my resources into getting there. If things don’t work out, I may go home and never think about it again. If I love Tibetans, I will find them anywhere. I will find them in places all along the border. I will find them in places where I can get an employment or business visa. I will find them in towns, villages and cities where I can afford to live, with all the freedom I need, to do what I want to do. This somehow made sense to me. I knew if I loved Indians, I could and would find them anywhere. If I loved Turks, I could find them in refugee camps on the German border; my love for the nation would not be limited by its borders. Wherever its people were, I could find them and I may not even need a visa. Post 107. Fun with the Philip family. The Philip family came all the way from Bombay to have a holiday with us. They had become close friends very quickly. Tony first met Arun on his trip with Dudley Reed. He knew instantly that they would have a David/Jonathan type friendship. JoyAnn was the one who had given us the word about “The bed of nails.” We still loved her even after all that. 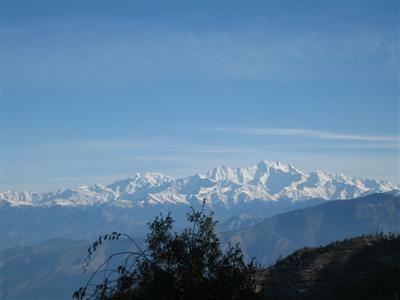 After the weekend, we jumped in the car and drove off to a small town called Kanatal towards Tehri Garwhal. It was a beautiful drive and we got glimpses of the snow capped Himalayas all the way there. We had booked a wooden bungalow at Colonel Sinha’s place. There were all kinds of little nooks and crannies and small rooms with low ceilings. It was homely and cosy. We dropped them off so they could have some family time. A few days later we drove back to join them. We were almost there but just before Kanatal, we ran into a total roadblock. Nothing was moving and no one was going anywhere. Cars were turning around and going back in the direction of Mussoorie. A truck had overturned and was spread across both lanes. A family of five, coming from Kanatal had left their vehicle on the other side and walked past the truck. They had lots of luggage. When we realised we would have to turn around to go back, we offered them a lift. The jeep was packed to capacity with everyone sitting on everyone’s laps. Asha and Zoë sat on my lap in the front. We weren’t sure if the son was a cowboy or an Indian. He seemed to be both with his high boots, tight pants and cowboy hat. Whatever he was, he told us in an Indian-American accent that he was getting married. They were on their way to his wedding. There was lots of noise and chatter all the way to Mussoorie. When we got there they insisted that we stayed for dinner, which we did. They had a lot of questions about our faith. We set off again the next day and made it to Kanatal. We met the Philip family on the road. They were so eager to see us again. It was as if they had been abandoned in Siberia. There was such a happy reunion. We spent most of the time playing games in the lounge. Pictionary was new to them and there was a lot of screaming and shrieking that went on. It was amazing waking up to clear blue skies and snow capped mountain ranges. Back in Mussoorie we were sillier than ever. The smallest thing made us all laugh hysterically. On their last night, Arun and JoyAnn were pottering around the lounge while Tony and I were getting ready for bed. The kids were still awake in their room. Tony let out a huge fart and said, “Babe!” Everyone heard it. There was nothing I could do to convince them it wasn’t me. We could not stop laughing. It took ages for us all to get to sleep. Silly times were so good for us. We were really intense about what we were doing. We needed to laugh and let our hair down. We needed to talk nonsense and be childish. We needed friends like Arun and JoyAnn to help us do that.